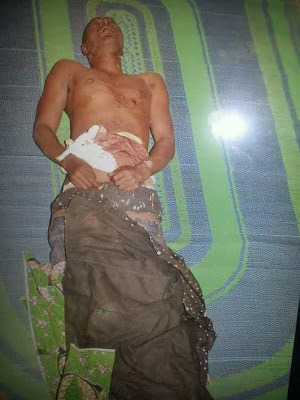 A father of 3 identified as Saminu Bara'u was allegedly killed by a police officer in Maraban Jos, Kaduna State on Tuesday. "A father of 3, commercial bus driver; Saminu Bara'u popularly known as Danlamiwas killed cold-blooded by a police officer in Maraban Jos, Kaduna State. The incidence occured around 8pm of Tuesday 15th November 2016 whule the victim was sitted outside his residence in Maraban Jos when a team of police stormed the area in the name of patrol. Having fractured leg and being innocent, Danlami remain sitted as the police arrived. One Police Officer nicknamed KURA (literarilly mean Hyena) ordered Danlami to stand up and run pr he shoot him, which he calmly replied that he cannot run because his leg is fractured displaying his crutches. 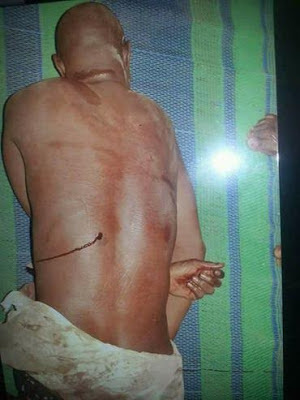 Unfortunately for Danlami, the barbaric for KURA shot him to dead (the pic). Immediately afte he shot Danlami, angry youths descended on KURA and were about to take jungle justice on him. It takes an intervation of some respected elders and a human right activist (name with-held) to rescue him. The case has since been filed at Unguwan Sunusi Police Station and we learnt that KURA was transferred to State CID. Our fear is the usual, we don't want the case dead at arrival just because a Police Officer involved. Let us stand up for justice! Let us think of his wife and 3 kids! The State Government should do something!! The IGP should ensure KURA is brought to book!!! Keep sharing until justice is done. All we want is #Justice4Danlami......... May his soul rest in peace."